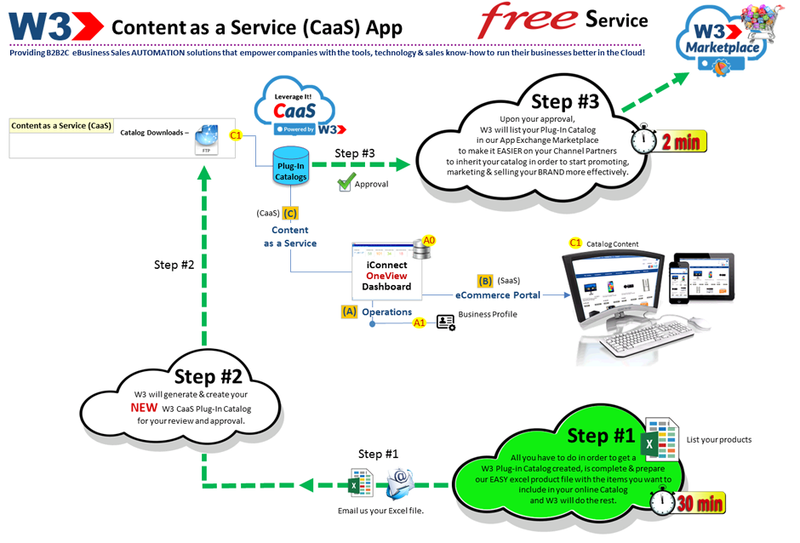 CaaS makes it EASY to share STRUCTURED data via the Cloud! The W3 Content as a Service (CaaS) App is a cloud-based data delivery solution that enables Content Owners (manufacturers, distributors, franchisors, wholesalers, agencies, associations & others) with the means to EASILY package, deliver and share structured Content in an on demand digital environment to make it EASY on Channel Partners to consume & leverage within their own iConnect business applications. The W3 CaaS offering makes it EASY on Channel Partners to license your Content on a subscription basis to use within their iConnect business applications. The Content is managed and maintained by you, the Content Owner (manufacturer, distributor, franchisor, wholesaler, agency, association & others) so Channel Partners can rest assured that they are always receiving & sharing the most up-to date Content available without having to allocate any resources to serve their customers. The W3 CaaS App makes it EASY on Content Owners to distribute and share their structured Content with Subscribers in order to make it EASIER on Channel Partners to promote, market and sell their brand more effectively in real-time. When you combine today's top cloud computing services (1-IaaS, 2-PaaS, 3-SaaS, 5-AIaaS, 6-BPAaaS & 7-iPaaS) in collaboration with Content Owners (4 - CaaS), you're able to create & provide Industry specific Channel Partner Solutions using W3's ALL-INCLUSIVE Business Solution as a Service (BSaaS) Apps. 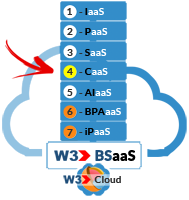 The W3 BSaaS App offer organizations with a one-stop turn-key eBusiness Solution that empowers Channel Partners with ALL the tools, technology and business know-how to help them run their businesses better in the Cloud through a SINGLE Business Platform! Getting Started is EASY & it's FREE! 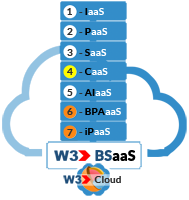 As a FREE Service, W3 empowers Content Owners with the tools, technology and resources required to make it EASY on Channel Partners to grow their business via the Cloud by creating their own W3 CaaS Catalogs. 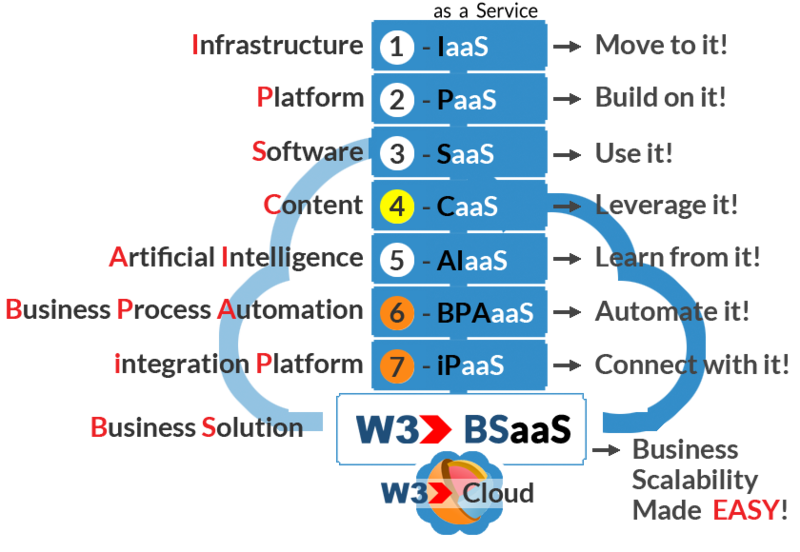 W3 is the ONLY as-a-service (aaS) solution provider that offers a one-stop end-to-end Enterprise-level eBusiness solution that empowers Content Owners with the tools, technology and business know-how to make it EASY on Channel Partners to inherit their Content in order to make it EASIER on them to promote, market and sell your brand more effectively.